Last week when we were with my son who lives in a town bordering the one in which I was raised, we noticed how much much it's changed. Showing my son some of the places that are memorable to me was kind f fun actually. He wondered what the big deal about this old place was. When I told him that it meant nothing, he asked, "Then why the picture, Mom?" The Pres responded before I could...he does that a lot...LOL!!! 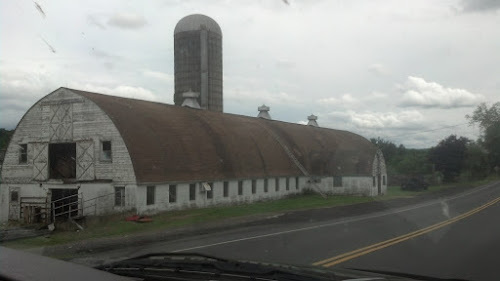 That is a great old dairy barn ! Wow that's a log barn. I'm thinking big dairy farm? I get teased the same way. Lovely barn! I appreciate you sharing it with us at Barn Charm. Someday maybe your son will realize the beauty in old buildings, and just taking a photo of something that appeals to you. It’s great that it is still standing. Hopefully, whoever owns it at least maintains it if he’s no longer using it, or maybe offer it to be renovated inside as a hall for gatherings. They can maintain the outward barn look but modernize the inside of it to further accommodate the idea. I agree. It looks like a good place to hold large gatherings. And since the barn still looks sturdy, it might only take a few reinforcements and renovation to make it look like the classic barn outside but a great venue on the inside. Why not suggest it to the local officials and turn it into a town project? That would be something.